Do you know what’s in your cleaners? Chemicals used in cleaning products are often irritating to the eyes, skin and respiratory system. They contain compounds that disrupt your hormones and the healthy bacteria that you need to thrive. Young children and pets are particularly vulnerable to the toxins in cleaning products. Fortunately, there is one natural substance that can replace many of the commercial products you’ve been buying all these years. Not only will you reduce your family’s exposure to chemicals, but you’ll save money too! It’s vinegar! Simple white vinegar can be used in so many ways to keep your home sparkling clean and free of mold or excess bacteria. If vinegar by itself doesn’t do the trick, you can be sure that some combination with other non-toxic natural cleaning agents will. Experts say that using natural cleaning agents like vinegar is just as effective as using chemicals. It may take a little more effort or time, such as leaving things to soak for a few minutes to get the maximum effect, but it’s worth it for your health. I have always had self-cleaning ovens until recently. I bought a new home and skimped on my appliances, leaving me with an oven I have to clean on my own. The best way to keep from having a huge mess in your oven is to wipe it down on a regular basis. Use a non-abrasive scrubber to remove any caked on food. If you are baking and something spills, pour salt on the spill immediately. This will make cleanup so much easier. I use a 50/50 solution of vinegar and water to keep the oven glass clean. If you have trouble with uneven water output from a shower or faucet, put some vinegar in a small bag and secure to the fixture using a rubber band or twist tie. Leave it on overnight and remove in the morning. Although I don’t use my dishwasher frequently, I do like to keep it clean. This helps with efficiency and prolongs the life of your dishwasher. Here is what I have found to be the best way to keep mine sparkling. First, remove all racks and utensil holders from the dishwasher. Use a damp paper towel to remove any food remains, shards, bones, etc. from the base of the dishwasher. Next, pour two cups of white vinegar into the bottom of your machine and run a low energy cycle. If you use your scissors a lot they can eventually develop a build-up. I use full strength vinegar on a rag to remove gunk and disinfect my scissors weekly. If you see hard brown stains around the rim of the toilet, look no further than white vinegar. Simply add one gallon of vinegar to the toilet bowl and let it sit. At the same time, saturate a number of paper towels in vinegar and then lay them around the toilet rim to effectively soak the stains. The toilet bowl will end up clean, shiny and disinfected. If stains are tough, leave the vinegar overnight then sprinkle with baking soda before scrubbing and rinsing. 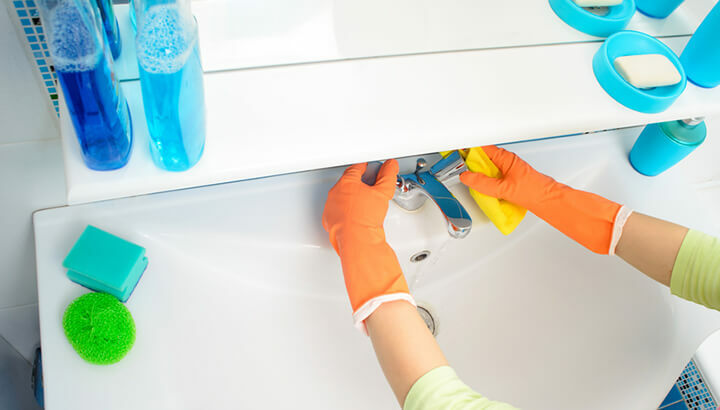 If you have trouble with a kitchen drain that smells and harbors drain flies (those tiny brown flies that are more annoying than fruit flies), pour vinegar onto a bottle brush, sprinkle with baking soda and scrub to remove built-up residue in the drain. My mini blinds get so dirty so fast. To clean them using white vinegar, simply put on a clean white glove and dip fingers into a solution made with equal parts white vinegar and hot tap water. Slide your fingers through both sides of the slats and the dirt will slide right off. Rinse your glove with warm tap water. A great cleaning scrub can be made with one teaspoon of vinegar and two teaspoons of salt. Rub onto fixtures and then wipe clean with a cloth. 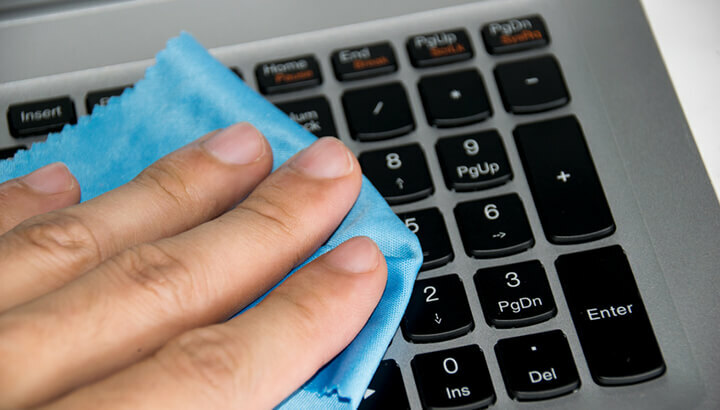 Use white vinegar to clean your computer naturally. I don’t know about you, but my computer gets downright nasty. I have discovered that the best way to keep it clean is to use white vinegar. Make a solution with 50 percent water and 50 percent vinegar. Dip a clean rag into the solution and squeeze as much liquid out of it as you can. Wipe down everything but your screen with this mixture. Use a cotton swab to get into tight areas. Remember, never use a spray bottle, as liquid may get into the circuits of your computer. I love this economical way to keep all my wood clean. Mix a quarter cup of vinegar with one cup of olive oil and a few drops of lemon essential oil. Wipe wood furniture with the mixture using a clean cloth. I have pets, so I have stains. I have purchased some really expensive carpet cleaner and found that my good ol’ white vinegar mixture does just as good a job. For light carpet stains, I rub the area with a mixture of two tablespoons of salt dissolved in 1/2 cup of white vinegar. I let the solution dry and vacuum. If the stain is big, I add two tablespoons of Borax into the mixture and use it the same way. Ground-in dirt takes a little more work. Make a paste using one tablespoon of vinegar mixed with one tablespoon of cornstarch and rub it into the stain using a dry cloth. Let it sit for two hours and vacuum. Note: I keep a spray bottle filled with five parts water and one part vinegar around the home. I also keep a second bottle with a one part non-sudsy ammonia and five parts water. When I see a new stain I simply spray the stain with the vinegar solution and let it set for a few minutes. After I blot the stain with a clean rag, I spray and blot with the ammonia solution. It may take a couple of rounds, but the stain will go away using this method. I use this method of cleaning in my car and my home for all leather surfaces. Mix equal parts white vinegar and boiled linseed oil in a spray bottle. Shake the solution well and spray on leather. Rub the solution in well using a clean cloth. After you let it set for a few minutes, dry with a second clean cloth. One of the most important ways to keep dangerous bacteria from invading your fridge is to keep it clean — like, really clean. Clean out your fridge once a week, if possible. Mix two parts hot water and one part white vinegar in a glass spray bottle. Add five drops each of lemon, orange and tea tree essential oil. Spray the mixture inside your empty fridge and let it sit for a few minutes. Wipe with a clean cloth. If you are like me, you would like to throw away those old ice trays that are covered in hard water stains. Even though ice trays are not expensive, it all adds up. Try cleaning your trays instead of throwing them away. Simply place your trays in a bucket of undiluted vinegar for a few hours. Rinse them well with cold water and let them dry. My teapot gets a workout and needs cleaning often. To clean my teapot I simply fill it with full strength white vinegar and let it sit for about an hour. I rinse it well with warm water and let it air dry. This scouring mix really works and costs pennies. I use this on all my metal cookware monthly to keep it sparkling. Mix equal parts salt and flour and add enough vinegar to make a paste. Use the paste immediately to clean pots and pans. Wash off with warm water and dry with a clean dish towel. White vinegar can clean stubborn stains in the bathroom. To keep your sinks and bathtubs shining, give them a good scrub with full-strength white vinegar. Just follow this up with a cold water rinse for a clean and disinfected tub and sink. If you need to remove hard water stains, pour three cups of white vinegar under running tap water and let the tub fill up. Allow the vinegar to sit in the tub for five hours. After the water drains out you should be able to scrub off the stains easily. To remove tough mildews stains use full strength vinegar in a spray bottle. Wipe with a clean cloth. If the stains are lighter, use a mixture of equal parts water and vinegar. Sometimes soap scum and water spots build up on ceramic tiles around your sink or bathtub. To bring back the shine, scrub them with a mixture of 1/2 cup vinegar, 1/2 cup ammonia and 1/2 cup Borax mixed in one gallon of warm water. Rinse the tiles well after scrubbing. Spring is here, so it’s time to mow your lawn again. To clean last year’s old grass and debris from your blade, simply wipe it down with a cloth dampened with undiluted white vinegar. It is almost time at my house to put up our hummingbird feeders. The little birds provide me endless hours of entertainment all season long. I like to start each season with really clean feeders. I seem to have more birds the cleaner my feeders are. I use a vinegar solution to clean the feeders at the beginning of the season and then a few times during the season. Mix equal parts vinegar and hot water and clean the feeders using a circular scrub brush. Rinse the feeder well with cold water and allow it to air dry. Spring cleaning, here you come! Hey Buddy!, I found this information for you: "How To Clean Just About Anything With White Vinegar". 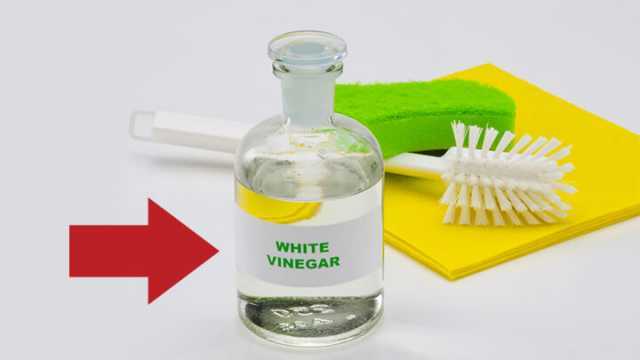 Here is the website link: https://www.thealternativedaily.com/how-to-clean-anything-with-white-vinegar/. Thank you.